Does your little guy enjoy airplanes and boats? Give him what he loves with these airplane and boat crafts! Each one is unique and will afford your son hours of fun, both in the actual making and in the imaginary journeys. Some use only a sheet of paper or a piece of Styrofoam. There are also vehicles from milk cartons, cardboard, craft sticks and magazine covers. Whether you make them as a kid’s party craft or your guy wants something to do himself, they all look like boy-joy fun! 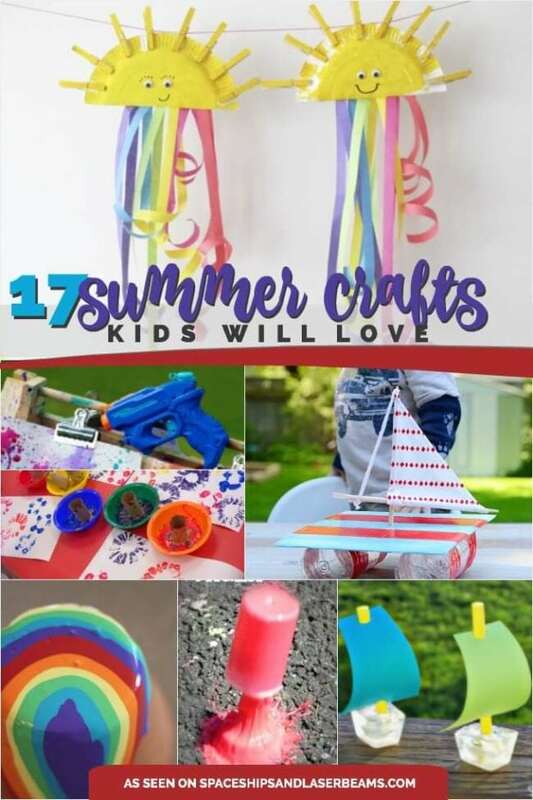 These 14 Summer Activities for Kids are perfect for keeping kids busy this summer! Keep kids imaginations engaged with these play tent ideas! Boys love making paper airplanes, but a great way to ramp up the fun is to conduct paper airplane experiments. A few modifications to the original paper airplane design can massively affect the distance it travels. Have some fun checking out these differences and recording the flights of each airplane. Just start with folding one airplane design, and follow the ideas for experimenting! Check out these awesome paper airplane crafts. The first idea is easy enough for little kids and involves creating simple airplanes out of colored craft sticks and glue. Paper towel tubes, cardstock, and silver paper (could use aluminum foil) are used to create the second airplane craft. And finally, the last airplane models are made from foam. One version is crafted out of craft foam, while the other is made from upcycled foam packaging from dinner takeout. The beauty of paper airplane crafts is that they are quick and easy to make, plus super fun to fly. Here’s an easy DIY paper plane project you can try with your son! It is fun, budget-friendly and can help children practice literacy, name-recognition and even gross and fine motor skills. You’ll love the easy-to-follow folding instructions. If you’re interested in making paper boats for a fun craft activity, check out this great tutorial which includes written instructions, as well as pictures. This tutorial starts with the crafter coloring a design on one side of a piece of paper with crayons prior to folding. The result is a colorful paper boat! Craft projects that use every day recycled materials are awesome! This easy toilet paper airplane idea requires empty toilet paper rolls, as well as Popsicle sticks in both small and large sizes. Part of the fun of this airplane craft is choosing which colors to paint the body of the airplane, as well as the wings and propeller using washable paint. The final step after everything is dry is adhering the wings and propeller with glue. These bandana boats look super and they’re easy to make. You’ll need some kraft and white paper for the bases of the boats and a bamboo skewer for the mast and bandanas to cut up for the sails. To weight your boats down, you may want to glue them to flat bottomed glass marbles or ceramic tiles. 7. Narnia and the North! Don’t throw out your cardboard boxes! This boat craft looks like a lot of fun! The plans start with a simple ship shape constructed out of pieces of cardboard cut into matching sides and a flat bottom. Hot glue is used to connect the sides to the bottom, meeting at the bow. A small trapezoid-shaped piece of cardboard is added to the back to help form the stern. You can print out sample pattern pieces to help you get started. Then simply follow the step-by-step instructions for creating your own cardboard boat. What’s more fun than a pirate ship? Make one like this today out of cardboard and other recycled materials. The complexity of this project makes it better suited for older children or adults, as several steps are involved, including cutting with a craft knife, coating with papier-mache and adding intricate details such as cardboard portholes and a captain’s wheel made out of matchsticks and cardboard. Your boy will have a great time making this boat craft from an upcycled milk carton. You’ll need to gather a few additional supplies including paint, a bbq skewer, fabric, piece of foam, and a craft knife. Young children may need some assistance with the craft knife cutting the portholes and top opening. Additional help may be needed to adhere the fabric sale to the skewer. Sail away with this paper plate sailboat. A fun party craft or favor, the sailboats are so adorable and only require a handful of materials—paper plates, toilet paper tubes, craft sticks, colored paper, glue, paint and paintbrush (could substitute colored plates). This activity is simple, but does require the use of a stapler and scissors/craft knife, so adult supervision and help may be needed. Children will love creating their boat and then personalizing it with colorful stickers and embellishments or hand-drawn details. Whether you’re trying to teach about Columbus Day, or just want the excuse to make a fun paper craft, this tutorial will walk you through the steps of how to make a paper boat! You’ll need to start with a 5 x7” piece of paper and pay close attention to all of the various paper folding techniques and instructions. When you’re finished, smile with pride over your new paper boat! Not only are these DIY paper bowls cheap, they are easy to make too! You just need some leftover paper (cardstock weight), scissors, a pencil, and a ruler. The resulting paper bowls can be used as decorations, as a party favor, or as a great place to store your car keys or trinkets. This paper project would make a great boat craft! Looking for more great DIY inspiration for play time? Here are a few more great ideas to check out.